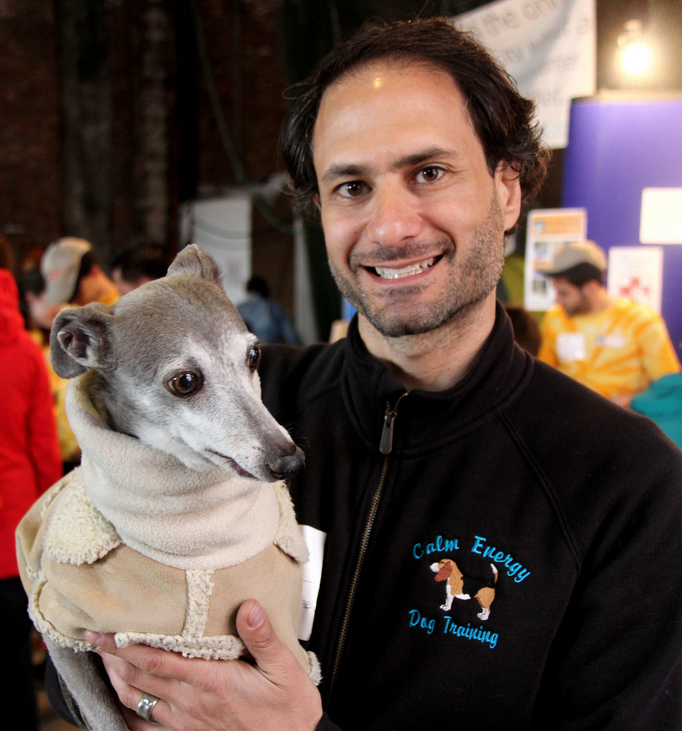 Calm Energy Dog Training is run by New York dog whisperer and canine behavior expert Anthony Newman, a former university professor (Ph.D.), professional member of the Association of Pet Dog Trainers (APDT), and Cesar Millan Ambassador. With more than a decade of radical success changing owners’ and dogs’ lives throughout Manhattan, Brooklyn, and surrounding NYC, Anthony has perfected a unique variety of non-treat-centric methods that help dogs become calm, peaceful, trusting, obedient, and social in challenging city environments. Having studied linguistics and teaching at their highest levels, Anthony has a knack for reading and understanding dogs, and teaching their owners how to foster a joyous and peaceful relationship with their canine companions — through private training sessions, group obedience classes, and interactive workshops in real-life situations like parks and busy city streets. Anthony’s own retired racing greyhounds have been certified as therapy dogs by The Good Dog Foundation, and have helped cancer patients rehabilitate from chemotherapy treatements and schoolchildren learn to interact peacefully with dogs. Anthony has been featured in New York Magazine, The New York Daily News, The Huffington Post, Gawker, Tails Magazine, and on many online news sites and blogs. He has been filmed by VH1 and Huffpost Live, and is a regular speaker at the New York Fellowship for the Interests of Dogs and their Owners. New York Magazine named Anthony “Best Dog Trainer” in their “Best of New York 2013” edition.